I created this poem in response to a problem I faced whilst designing materials for Mental Health Awareness Week at Sunderland College: how can I describe ‘worry time’ to students in a way which is simple, memorable and fun? I placed copies of the poem in small gift boxes, which the students could personalise and take away. The idea proved to be popular and was easily understood. Whilst the poem was designed to facilitate promotional work, I believe that it may also have a place within therapy. Graves (1922) argued that ‘a well-chosen anthology is a complete dispensary for the more common mental disorders and may be used as much for prevention as for cure’ (p.85). Indeed, before therapists, poetry helped individuals cope with their difficulties by validating their problems, thus reducing the sense of isolation experienced (Harrower, 1972). Whilst I am not suggesting that my poem provides the solution to excessive worry, evidence supports the utility of poetry in therapeutic work. Reading poetry helps patients express their feelings (Mazza & Prescott, 1981) and promotes self-discovery (Mazza, 1981). This is supported by neuroscientific research: reading experimenter-selected poetry activated the posterior cingulate cortex and the medial temporal lobes, areas linked to introspection (Zeman et al., 2013). Patients often struggle to remember health-related information (Ley, 1989), but rhyming verse is easier to recall than standard text (Walton, 2011). Furthermore, reading and discussing poetry may promote greater learning than passive listening (Foster & Freeman, 2008). And fill you with pure dread. Release me from your mind. As I once appeared to be. - See also our second annual poetry competition. Foster, W. & Freeman, E. (2008). Poetry in general practice education: Perceptions of learners. Family Practice, 25, 294–303. Graves, R. (1922). On English poetry. London: Heinemann. Harrower, M. (1972). The therapy of poetry. Springfield, IL: C.C. Thomas. Ley, P. (1989). Improving patients' understanding, recall, satisfaction and compliance. In A.K. Broome (Ed.) Health psychology: Processes and applications (pp.74–102). London: Chapman & Hall. Mazza, N. (1981). 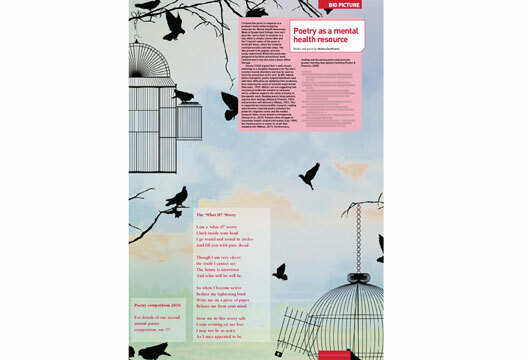 The use of poetry in treating the troubled adolescent. Adolescence, 16, 403–408. Mazza, N. & Prescott, B.U. (1981). Poetry: An ancillary technique in couples group therapy. American Journal of Family Therapy, 9, 53–57. Walton, K. (2011). Thoughtwriting – in poetry and music. New Literary History, 42(3), 455–476. Zeman, A., Milton, F., Smith, A. & Rylance, R. (2013). By heart: An fMRI study of brain activation by poetry and prose. Journal of Consciousness Studies, 20, 132–158.